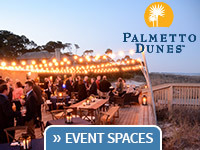 When it comes to Hilton Head meeting facilities, you’ll discover that the island is the ultimate place to work and play. The island features a wide range of meeting spaces for conferences, conventions or business meetings. Conference space comes in all sizes, with meeting rooms and banquet rooms available for any business function. Business services also include event planning, state-of-the-art technology and fresh, seasonal catering. Whatever you need, you’ll find it on Hilton Head.